Easy baked spaghetti made with ground beef, marinara sauce, mozzarella cheese, and a hidden layer of creamy pesto sauce in the middle. Pure comfort! 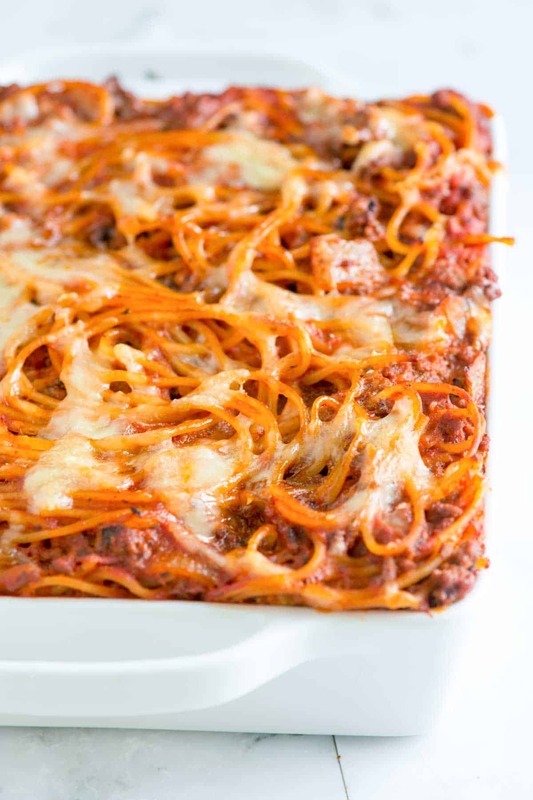 Jump to the Easy Baked Spaghetti Recipe or read on to see our tips for making it. Our readers have said that our Meaty Lasagna Recipe is the best they’ve ever made. We combine beef, sausage, and a homemade sauce. For a vegetarian spin, our Fresh Vegetable Lasagna has tender vegetables, a light tomato sauce and lots of cheese. This Baked Ziti with Spinach and Artichokes requires only 15 minutes of hands-on time! Our Baked Macaroni and Cheese is extra creamy and made with butter, flour, milk, and cheeses. This baked spaghetti has everything we love about baked pasta. There’s noodles, a hearty meat sauce, lots of cheese, and we even add a layer of sour cream mixed with basil pesto to the middle. My favortie thing about baked spaghetti is that it comes together quickly. We love pasta and red sauce, but we love it even more after adding sweet cooked onions and ground beef. You can use homemade marinara sauce — here’s our version — or use jarred spaghetti sauce. To make the meat sauce, cook onions and ground beef until the beef is browned. (We’ve made this recipe with ground chicken and ground turkey before, both are excellent). Add the marinara sauce, bring it to a simmer, and then toss with cooked spaghetti. Here’s a tip: Undercook the spaghetti by 1 to 2 minutes. This way, when we toss it with the marinara sauce and bake, the pasta won’t become mushy. 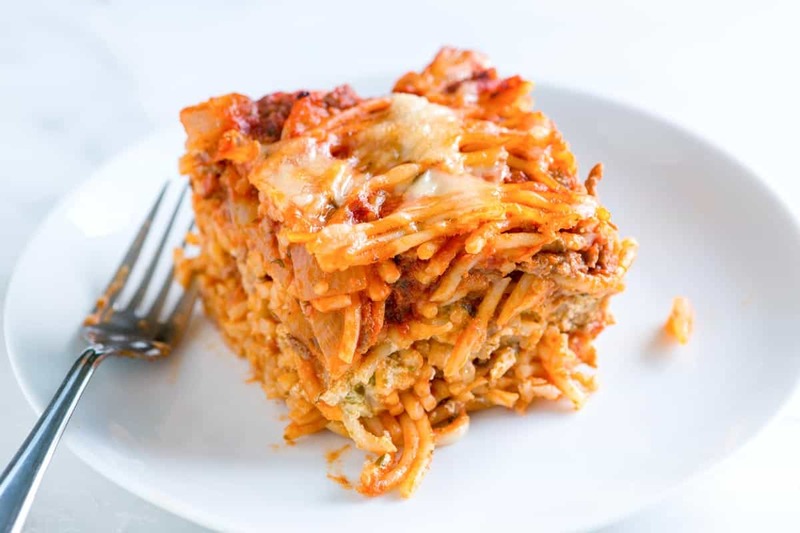 You can add the spaghetti and meat sauce to a baking dish and top with cheese, but to make this the best baked spaghetti, add a creamy pesto layer to the middle. To make it, mix sour cream with basil pesto. Add half of the spaghetti and sauce to a baking dish then spread the creamy pesto on top. Finish by adding the remaining pasta on top. To finish, add lots of mozzarella cheese to the top and bake until bubbly. This easy baked spaghetti has ground beef, marinara sauce, and a middle layer of creamy pesto. If you are like us, this will become your new favorite meal! Consider swapping the ground beef for sausage, ground chicken or ground turkey. To make this meatless, remove the beef – the spaghetti will still be delicious. 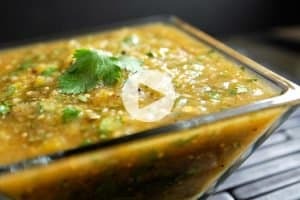 You could also add some cooked vegetables like mushrooms and zucchini. Heat oven to 350 degrees F. Butter a 3-quart baking dish or spray with non-stick cooking spray. Bring a large pot of salted water to the boil, add the pasta then follow package directions, but cook 1 to 2 minutes less than the package calls for. Drain. 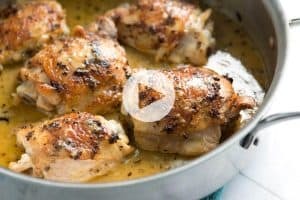 Meanwhile, heat the olive oil in a large skillet with sides. Add onions and cook until translucent, about 5 minutes. Add the ground beef and cook until browned, about 10 minutes. As the beef cooks, use a wooden spoon to break the beef up into small pieces in the pan. Season with 1/4 teaspoon of salt and a few grinds of black pepper. Drain excess fat from the beef. Pour in the marinara sauce and cook until heated through. Take the pan off of the heat and add the cooked and drained pasta. Toss well then taste for seasoning and adjust with salt and black pepper. In a small bowl, stir sour cream and basil pesto together until well blended. Spoon half of the pasta into the baking dish. Spread the sour cream and pesto mixture over the pasta and scatter with half of the mozzarella cheese. Top with the remaining pasta, lightly press everything down into the baking dish and then scatter spread remaining mozzarella cheese on top. Place the baking dish onto an aluminum-lined baking dish (just in case any sauce drips over the sides of the baking dish). Bake until the cheese has melted and the sauce is bubbling; about 30 minutes. Let stand about 10 minutes before serving. If making ahead, you can cover and refrigerate, unbaked up to 2 days. When you cover, use parchment or wax paper between the spaghetti and aluminum foil. Aluminum foil can react with the tomatoes. The meat sauce can be made in advance and should last in your refrigerator up to 3 days and in your freezer for about three months. We recommend using freezer-safe glass containers, or double layers of freezer bags to store sauces. To thaw, leave it overnight in the refrigerator. Baked spaghetti also freezes well. Let it cool completely on a rack before freezing, and then wrap it very well with foil (we use two layers). 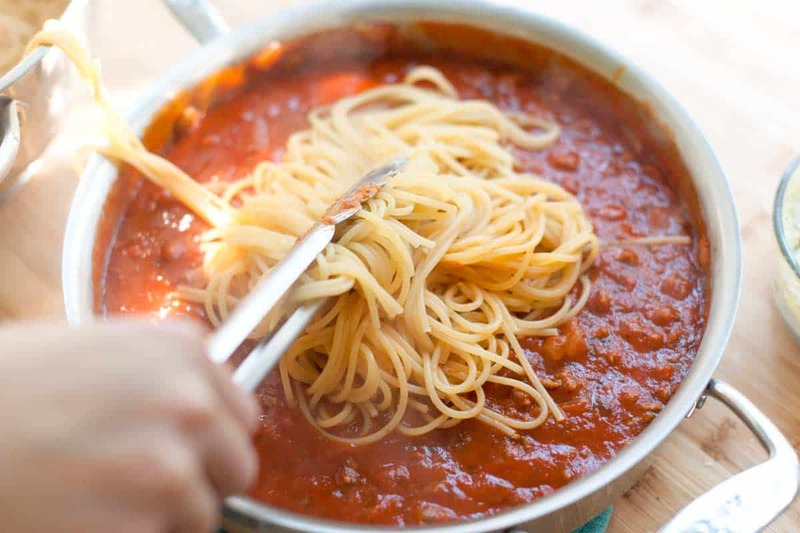 Defrost the frozen spaghetti overnight in the refrigerator and then bake at 350 degrees F for about 1 hour. Love the added twist of cream cheese and pesto topping. 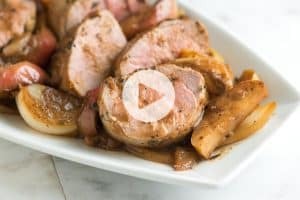 I substituted mushrooms for the meat to give the dish a healthier basis. Will definitely keep this recipe in my collection. Had it for dinner tonight and it was AWESOME. I used ricotta cheese instead of sour cream. Yum-o. Thank you for the recipie. I’m trying this tonight, Joanne. Looks delicious! Thanks for sharing the recipe. Do you think I could assemble the night before and then bake when I get home for the day? Or do you think the pasta would absorb too much of the sauce? You should be fine. The spaghetti will absorb some of the sauce, but it should be fine. if you are worried, though, you could undercook the pasta a little before assembling. Then, it will soften up overnight and while baking. 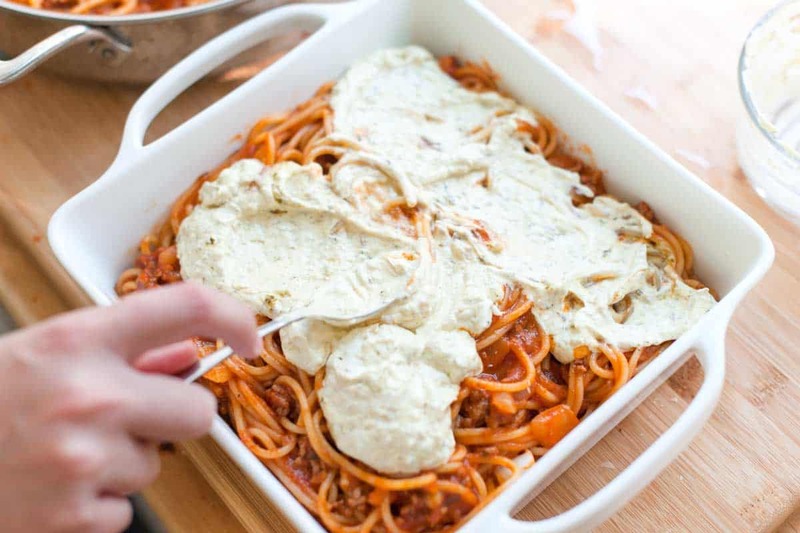 I want to make this baked spaghetti recipe but am not too fond of sour cream. Do you think I could substitute ricotta cheese? 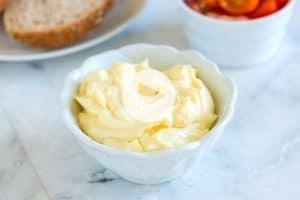 Hi Roy, Ricotta cheese or even cottage cheese would work well. My family & I loved this! Woah, this looks amazing you guys!! Adding this to my list to try soon! This is my quick fix meal. i usually use regular cheeses and add a tin of baked beans. will try the pesto and basil next time. Amazing! I’ve always wanted to try baked spaghetti! And that middle layer of pesto sounds to die for! I can’t believe I’ve never made baked SPAGHETTI before! It sounds like so much fun, as does the layer of pesto in the middle! Love your baked spaghetti recipe. Thanks for including a link to mine!